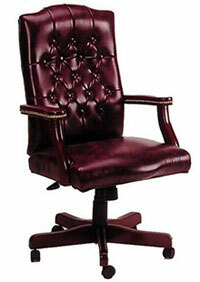 ROF offers new executive leather chairs from only the best brands. All of ROF’s furniture is manufactured to the highest standards and with superior materials to ensure durability, lasting integrity, and comfort. Plus, along with your new executive leather chairs, you get ROF’s signature customer service, meaning that ROF is there to help you during every step of your purchase, moving, and installation. Description: Task Chair with breathable mesh back. Adjustable arms with soft surfaces, Synchro-tilt mechanism with lock and tension control, adjustable lumbar support, pneumatic height adjustment, molded multi-density foam seat cushion, and dual casters for easy movement. Description: Armless connectable side chair. Stacks up to 20 high with storage cart. Available in black, gray, or white. Description: Mid-Back Task Chair with breathable mesh back, black fabric seat, black base. Adjustable arms with soft surfaces, Synchro-tilt mechanism with lock and tension control, adjustable lumbar support, pneumatic height adjustment, molded multi-density foam seat cushion, and dual casters for easy movement. Description: Task Chair with Black Mesk back, Black Fabric Seat, and Black base. Also features 3-way adjustable arms, pneumatic height adjustment, Synchro-tilt mechanism with lock and tension control, lumbar support, seat slide adjustment, and dual casters. Chair is green certified and made of recycled and recyclable materials.